Myle Enterprise celebrated our 3rd anniversary this year on 6 March 2016. As we turn THREE this year, we decided to create an event called “Threeasure Hunt” (pronounced “treasure hunt”) on our birthday month. This event is a twist from the usual treasure hunt events. We will post up hints or clues regarding the event venue on our online social media platforms, then if you guess it correctly and end up at the event venue where we are holding the event, you will receive a prize. The event details are as follows. Venue : All around Penang. We will be travelling to different spots on the Penang island. You can register on the spot when you find us at the event venue where we are at and then you need to take a picture with our event props. After that you get to take home your prize. Our event details can also be found on our Facebook page at https://www.facebook.com/events/1067286909996799/ . We will be posting up hints on our Facebook event page including our whereabouts and the time of the event, so stay tuned. Here is the flyer on the Threeasure Hunt event. *This flyer is correct at the time of publishing this post and may be subject to changes later. 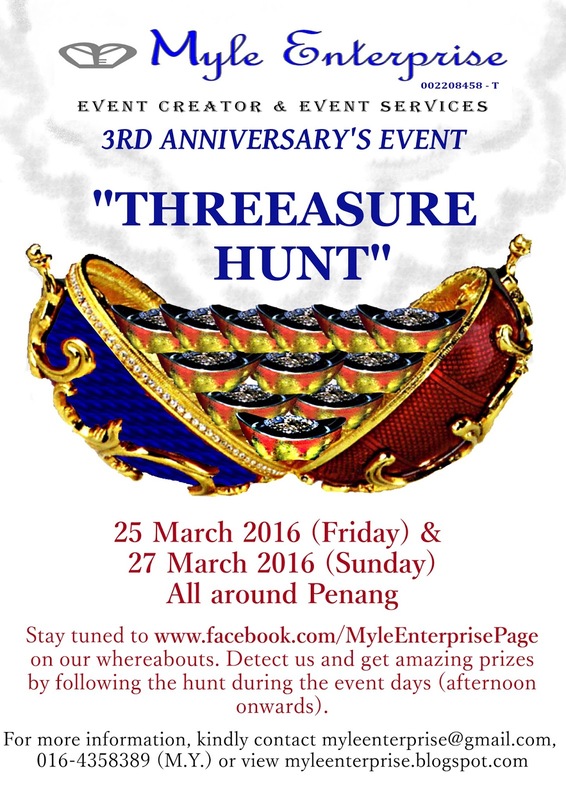 Don’t miss out on this event and a chance to play with us for our Threeasure Hunt. Welcome to Myle Enterprise’s website and blog space. We are an event creator and event organising business based in Penang, Malaysia.